So wait, has Michael Bay actually been listening to his detractors? 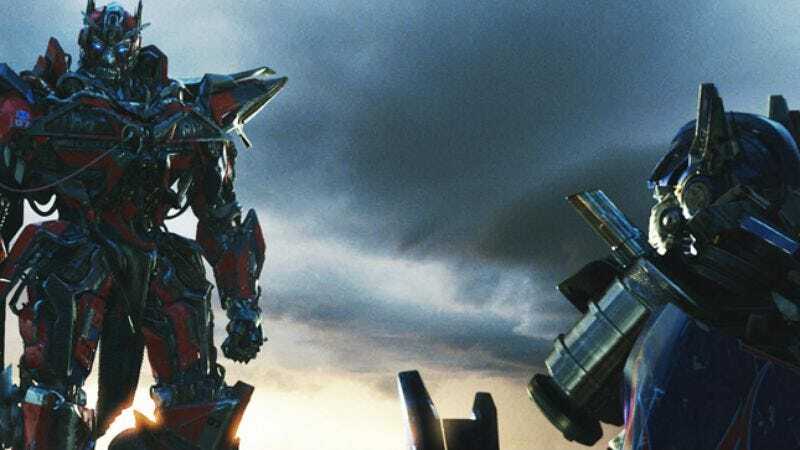 As difficult as that is to believe, given the director/producer’s legendary arrogance (and massive box-office success), his third Transformers movie suggests he’s actually taken some of the backlash to heart. Gone are the embarrassing racial stereotypes and crass body-parts humor. The slapstick and humiliation comedy have been dialed down to token levels. There’s a competent, authoritative female character (a high-ranking government functionary briskly played by Frances McDormand) and a competent, authoritative African-American hero (Tyrese Gibson, revisiting his character from the first two movies, but as a leader instead of a comedic second banana). Many of the action scenes are coherent enough to follow with the naked eye. And while the female lead (Rosie Huntington-Whiteley, stepping in for the banished Megan Fox) is alternately a bimbo, a shrew, and a princess-in-peril, at least the film treats her sexuality frankly, without fetishizing, sniggering, or cringing from it. It’s as though Bay has upgraded his ideal audience from 13-year-old boys to 18-year-old boys. That said, Transformers: Dark Of The Moon is still a wearyingly overlong series of battles and explosions with the thinnest of connective tissue and an ADD-esque disregard for follow-through. The plot concerns a game-changing piece of Autobot technology that crash-landed on the moon in the 1960s and must now be recovered before the Decepticons get it, but as with the previous Transformers movies, plot isn’t the point: Any stated character goal is either rapidly dealt with, dramatically reversed, or turned into an action setpiece so protracted that by the time it resolves, it’s difficult to remember where it began. While the first 90 minutes is a blur of ancillary characters (including Community’s Ken Jeong inducing gay panic in nominal hero Shia LaBeouf in a bathroom stall, Firefly’s Alan Tudyk poncing about with a silly accent, and Patrick Dempsey as a boor so rich, he’s apparently commandeered the Milwaukee Art Museum as his private garage) and unnecessary business (including the de rigueur LaBeouf troubled romance), the film eventually settles down to its primary business, of blowing up downtown Chicago at great length and in great detail. And once it finally does, Transformers: Dark Of The Moon is solidly mindless, breathless summer fun. While virtually all the action sequences either go on far too long or cut out abruptly in the middle, as if Bay suddenly lost interest, they’re at least creatively staged and eye-poppingly imagistic. While it would be nice to care at all about the people bouncing around inside all the CGI mayhem, by now, anyone going to a Michael Bay movie should know better. At this point, it’s enough that the most egregiously offensive and creepy content has been disposed of, leaving explosion-lovers of all colors, genders, and national origins to enjoy their atavistic violence without feeling personally insulted.